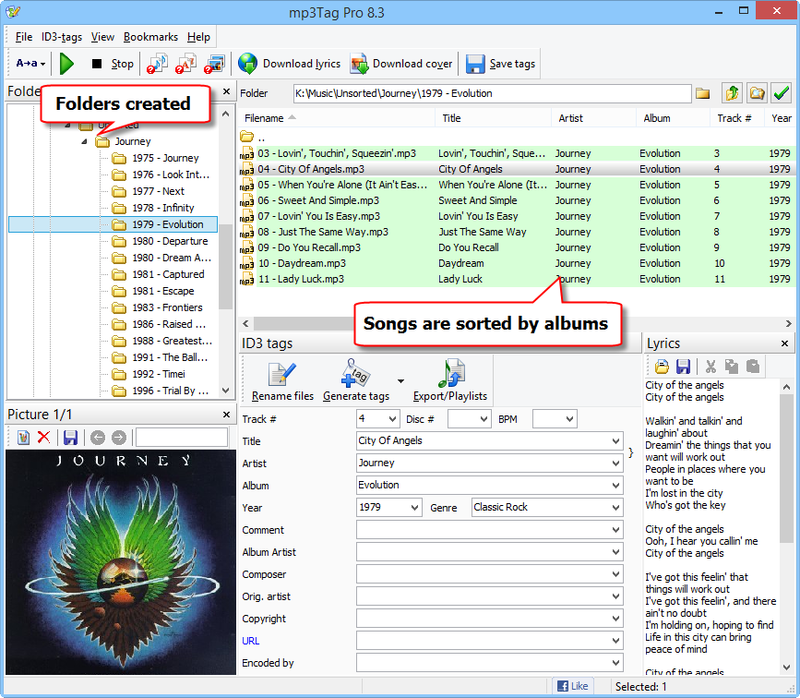 mp3Tag Pro helps you download missing tags for your music files (MP3, APE, FLAC, M4A, AAC, and others), import tags from text files, create playlists, generate tags from filenames, and more. On the other hand, you can use information from tags to rename audio files, so instead of names like track01 the program creates meaningful filenames according to your preferred pattern. Sorting audio files is closely related to renaming. In the corresponding article we discussed how to change filenames using information from tags. But this can easily be extended to sorting songs, if we use a format that creates folders. 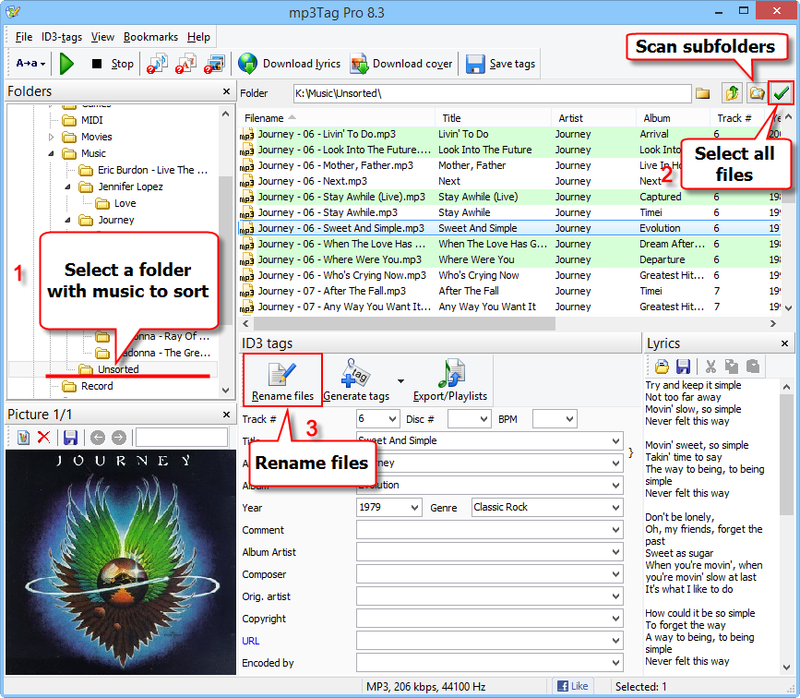 Here we will take a group of MP3 files stored in a single folder and use mp3Tag Pro to create a clear structure of folders. All songs will be sorted into their respective folders (by music albums). Other supported formats can be sorted in the same way. As usual, we start with selecting audio files. In the "Folders" area (1), select a folder with audio files to sort. Files from the folder are displayed in the main area, on the right. If there are some nested folders, and you need to include audio files from them as well, click the "Scan subfolders" button. To select all displayed files, click the green checkmark button (2), or press Ctrl + A. Finally, click the "Rename files" button under the list of files (3). Now we need to select or enter a pattern into the "Format" field (1). We discussed this in more detail in the article about renaming, but now we will additionally create folders. As usual, all variables are available in the list next to the "Format" field. This format tells the program to use album names (%L) for creating folders. Files of each album will be sorted into the respective folders without changing their filenames (%O stands for "Old filename", do not confuse that with %0 (null), which stands for track number). If we sort our music files so and then open the folder in Windows Explorer, we will see the album folders sorted alphabetically. In most cases, however, it is more natural to have all albums of an artist sorted chronologically, by their release year. This will create folders like "1988 - Greatest Hits" and sort songs into the respective folders without renaming them. This will rename our files using the <Track#> - <Title> format, so a real-world filename would look like "01 - Higher Place.mp3". This will create a folder for each artist (%A), into which all albums of the artist will be saved, sorted chronologically. 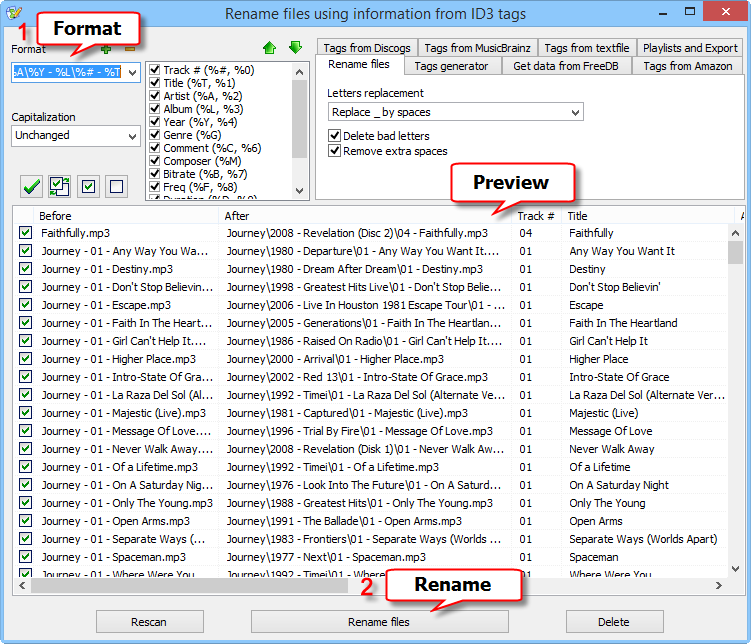 Click "Rename files" (2) to sort your music files. The "Rename" window is closed, and our MP3 files are now sorted. You can always see future file/folder names in the preview area of the "Rename" window. Please note that the "level up" rule applies to the folder selected in the "Folders" area of mp3Tag Pro. If you press the "Scan subfolders" button, you can work with all files from all subfolders. No matter how deeply the files are nested in the selected directory, they all will be moved up to the parent directory of the currently selected one. Another special items for folders allows moving files from nested folders into the currently selected one: "." (a single point). If we use this format instead of the previous one, all songs from individual album folders will be moved into the artist's folder (and not into its parent, which, in our example, is "Unsorted"). Using the above described methods, you can easily sort, organize, and re-organize songs and other audio files on your disks.